Lifeline Fitness Cables are built using Progressive Layering Technology", so each cable has multiple layers that work together to add durability and provide extremely smooth cable feedback across even the widest ranges of motion! 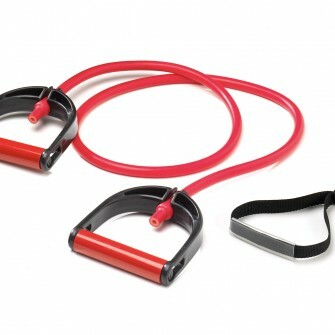 Add to your cable, a pair of Exchange Handles and door attachment and you have an incredibly effective resistance training system! The patented Exchange Handles are ergonomic and have loads of subtle cable saving and comfort adding features. The most important is the patented cable pocket design. The open channel allows you to swap cables with the same handle - and with 10 resistances offered, you'll never outgrow this incredibly effective fitness system! Get started with an R3 or R4 cable and work your way up. For more advanced users, start with an R5 or R6 cable. As you advance, just pickup the next resistance cable and use it with the system you already have! The reviews say it all - Lifeline USA makes the best cables and cable systems on the market! Try one today!